The Point Peninsula Complex was a Native American culture located in Ontario and New York from 300 BCE to 700 CE(during the Middle Woodland period), and are thought to have been influenced by the Hopewell traditions of the Ohio River valley. This influence seems to have ended about 250 CE, after which burial ceremonialism is no longer practiced. The Hopewell Exchange system began in the Ohio and Illinois River Valleys about 300 BCE. The culture is referred to more as a system of interaction among a variety of societies than as a single society or culture. 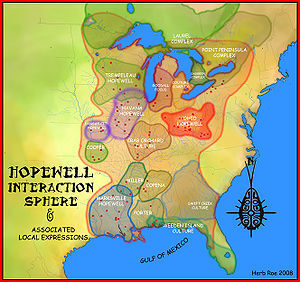 Hopewell trading networks were quite extensive, with obsidian from the Yellowstone area, copper from Lake Superior , and shells from the Gulf Coast. In some areas Point Peninsula people buried some of their dead in mortuary mounds. Interred with the dead were exotic grave goods including copper and silver pan pipes, marine shell gorgets and exotic cherts. It has been suggested that the exotic goods among the burials provides evidence for inherited status differentiation among Point Peninsula groups. The Point Peninsula people of the Middle Woodland period lived by hunting and gathering, supplemented by agriculture. Around 900 CE Point Peninsula artifacts in New York are replaced by Owasco culture artifacts, which archaeologists believe were Clemson Island complex peoples, spreading northward and intermingling with the Point Peninsula complex. The Owasco peoples practiced different pottery techniques and were more sedentary agriculturalists then the Point Peninsula people. The Owasco are thought to have become the Iroquois people of Pennslyvania and New York . Some important sites are the Rice Lake/Lower Trent River area including the Serpent Mounds Park, Cameron's Point and LeVescounte Mounds in Prince Edward County. The Serpent Mounds Park at Rice Lake was occupied during the prehistoric Middle Woodland Period. The burial mound was shaped like a giant snake.